Sometimes we like to find alternative routes up the hills that we climb, in particular a good rock scramble provides a challenging way to the top. Scrambling is not to be taken lightly but although not full-on rock climbing, it does need some skills. A helmet is the minimum requirement and sometimes a harness, rope and slings/nuts are necessary. Having skirted around Ben Crom on the eastern side of Ben Crom Reservoir we crossed the dam and then turned right along the foot of Ben Crom. We gradually ascended diagonally up the steep slope of the hill across a boulder field until we reached a prominent patch of heather running down the hillside. This was followed upwards to the foot of the Summit Gully (J314259 A) at an elevation of 375m (about 150m below the summit). The Summit Gully is an almost vertical gash in the side of the mountain with steep enclosed walls in the lower part which casts an obvious shadow on the mountain. The climb up the Summit Gully (red line on the photograph) is mostly a moderate scramble but the crux of the route is just 10m above the start where some large boulders block the gully. Climbing up under the boulders and stepping right on the gully wall gives a difficult or VD climb to surmount the boulders. There is no protection here, the rock is slippery with vegetation and a fall for the leader would be serious. 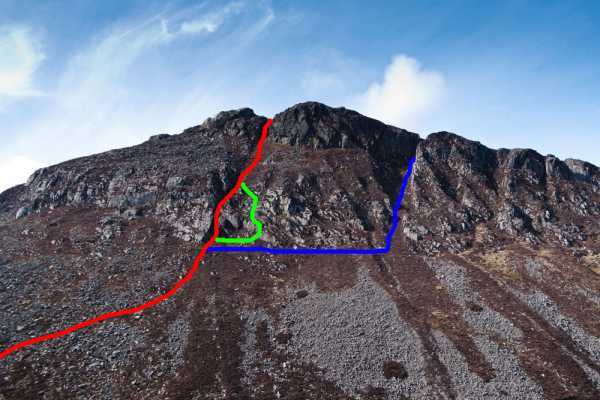 An alternative to the direct ascent of the gully and a by-pass of the boulders is to traverse right (NE) for about 20 metres to gain an easy scramble (green line on the photograph) up mixed rock and vegetation and then traverse left back into the gully. Soon the gully begins to widen out across a heather covered slope below the main vertical cliffs on Ben Crom before narrowing again towards the top. The final scramble up a short rock face in the gully exits almost precisely at the summit of Ben Crom. For those who don’t fancy the scramble route to the summit there is an easier route further NE up the Great Gully. To get to the Great Gully (J315260 B) traverse about 130m NE along a sheep track from the foot of the Summit Gully. The Great Gully is a prominent grassy ramp ascending at an angle up the hillside (blue line on the photograph).